Xue xiangling , a girl from a wealthy family got an embroidered treasure pouch, Suo Lin Nang on her marriage day from her mother as the local consuetude indicated for earlier giving birth to child. On the way for wedding, it was raining .When Xue and her relatives sheltered in the Chun Qiu Pavilion from the rain they met another bride from a poverty family, Zhao Shouzhen who was crying in a poor sedan chair for her miserable situation. With a kind sympathy, Xue presented Suo Lin Nang to bride Zhao, they then parted each other after the rain stopped . Six years later, Xue was separated from and lost touch with her family because of a flood occurred in Deng Zhou. Xue drifted to Lai Zhou and met her former servant Hu Po who recommended Xue to work as nurserymaid in the Lu Yuan Wai’ s residence ,a family of wealth in Lai Zhou. While doing tendance for Lu Yuan Wai’s son Tian Lin, Xue had all kinds of sad feelings well up in her heart. Coincidently she found that Suo Lin Nong and wept with her grief when picking up a ball for the kid in the master’s sitting room in small building, and thus Xue realized that Lady Lu was the bride Zhao in those years. Zhao asked Xue for her life experience and was aware of that Xue was the women who presented Suo Lin Nang to her for almsgiving. 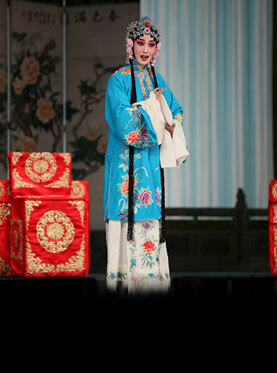 Lady Lu redressed for courtesy treatment to Xue and they became sworn sisters with a new and happy life.